How To Grow Sugar Snap Peas & Snow Peas - The Perfect Spring Crop! You might be surprised just how easy it is to grow sugar snap peas and snow peas in the spring and fall. These sweet tasting pea varieties, as well as traditional green shelling peas, thrive in cooler weather. In fact, peas are one of the earliest crops that can be planted each spring. And one of the last each fall! In addition, they require very little nutrients from the soil, and can produce a big crop in a short time. There are actually three main styles of peas. Probably the most well known of the three is the traditional green shelling pea. Often referred to as English peas, this variety requires shelling of a tough outer skin to reveal the tasty green peas inside. Although they are delicious, today’s article covers the other two types. The snap-pea or sugar snap pea, and the snow pea. These sugary-sweet peas can both be eaten pod and all. Traditional English peas growing in a garden. And with the ease of which they can be grown, it makes them an attractive addition to any backyard garden. Let’s just say the crisp, tender flavor of sweet peas will make you want to grow them every chance you get! Here is a look at each variety, along with planting and harvesting instructions. We have also included seed links to a few top varieties of each. Sugar Snap peas (snap peas) are fat, plump peas that burst with flavor. When picked early, they are extremely tender and juicy, and can be eaten pod and all. Sugar snap peas are plump and juicy. With their crisp, crunchy sweetness, they make the perfect snacking pea. In fact, for many home gardeners, it is hard for them to even make it out of the garden. For a special treat, try grilling them with a touch of salt. Absolutely delicious! Snow peas are the flat variety of peas most often found in stir-fries. As they grow, their see-through outer coating reveals tender pods beneath the surface. Snow peas are thin-skinned peas perfect for fresh snacking – and for stir fries! Snow peas need to be picked early before the pods mature. This is when crispness and flavor are at their peak. And just like snap peas, they can be eaten pod and all. Peas love cool weather. In fact, they thrive in it. Peas can be difficult to grow once summer sets in, so early planting is a must. Once temperatures begin to consistently approach the mid-80’s, peas will begin to end their production. Plant pea seeds in early spring as soon as the ground warms to around 45 to 50 degrees. Young pea plants can handle a bit of frost. In general, they can go in the ground about 2 to 3 weeks before your area’s last frost date. Grilled sugar snap peas – a treat like no other! Peas do not require super-rich soil to grow well. In fact, they actually help to improve the soil they are grown in. Peas are a member of the legume family. And this family of plants is one of the few that help fix levels of nitrogen in the soil as they grow. So not only are they tasty, they help your garden soil wherever you grow them! Plant seeds an inch deep in the soil, spacing them 1″ apart. Be sure to leave at least 18″ inches between rows. Sugar snap and snow peas do not have to have a support or trellis. However, they are much easier to manage if allowed to climb. How To Grow Sugar Snap Peas & Snow Peas : Peas grow best with a bit of support. It also makes them much easier to harvest! A simple piece of fencing on a couple of stakes in the middle of each planting row will do the trick. It really helps at harvest time! Once planted, peas benefit greatly from mulch. A two to three inch layer of compost or straw works wonders. Mulch helps to keep the soil temperatures regulated, and conserves moisture as well. The compost mulch even provides a bit of extra nutrients to the peas as well. It is important to harvest peas regularly. Pea plants will continue to produce blooms as long as the plant is not overloaded. 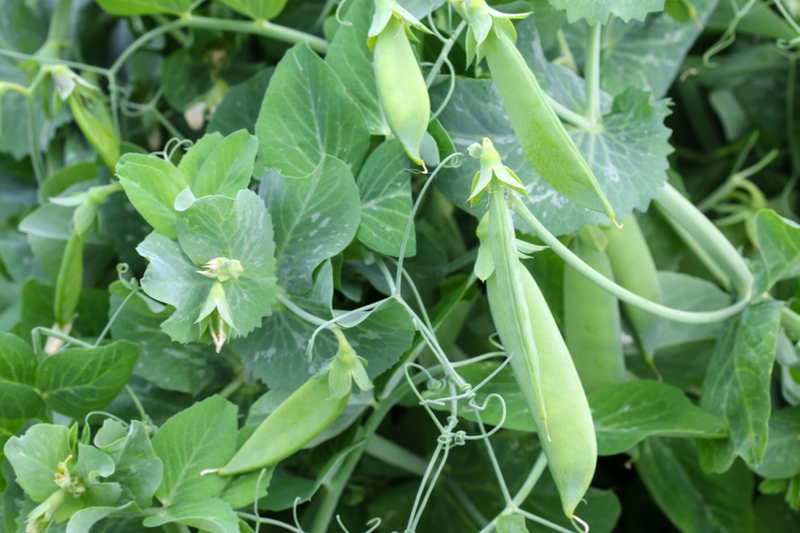 If it becomes too heavy with peas, it is a signal to the plant to stop producing new blooms. When warm weather finally puts an end to new blooms, simply pull up the plants and compost. Peas can also be planted in late summer for a fall crop. Planting in late summer lets the peas take off as the cool weather of fall sets in. Plant peas about 6 to 10 weeks before your first average frost date. You will be able to harvest up until the first hard frost. The pea plants can then be pulled and composted. As a general rule of thumb, a fall harvest of peas will not be as prolific as a spring planting. March 16, 2019 TIMG Comments Off on Planting & Growing Rhododendrons – Add Big Color To Your Landscape! February 10, 2018 ThisIsMyGarden Comments Off on 4 Easy-Grow Potted Patio Herbs To Grow For The Kitchen!